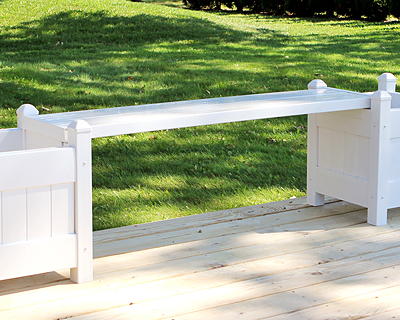 Turn two existing, Dura-Trel planter boxes into a wonderful bench with this Dura-Trel Planter Seat. These two lasting, vinyl planks create a classic, flat bench, its 48" length adding a focal point to your landscaping. The 11" width of the seat offers plenty of room and comfort, and the white color of the vinyl remains bright and lovely for many seasons. Attach the two shorter sides of the planks to your existing Dura-Trel Small Planter Boxes (not included) with the included hardware, so you can enjoy your favorite flowers as you relax on the seat. The vinyl body will not warp or rot, and cleans in moments for a low-maintenance and vivid item. Add seating to your backyard with this Planter Seat. Assembly required. Made in the USA. Twenty year warranty. Note: This description refers only to the Dura-Trel Planter Seat. The planter boxes shown are not included and must be purchased separately.